California Internet L.P. dba GeoLinks Ranks No. 604 on the 2017 Inc. 5000 with Three-Year Sales Growth of 748%. “It’s crazy to think that I started GeoLinks out of my home in Ojai, California back in 2011. However, even from the beginning, I've always known that we'd go big and disrupt the industry. Inc. magazine today ranked California Internet L.P. dba GeoLinks NO. 604 on its 36th annual Inc. 5000, the most prestigious ranking of the nation's fastest-growing private companies. The list represents a unique look at the most successful companies within the American economy’s most dynamic segment— its independent small and midsized businesses. Companies such as Microsoft, Dell, Domino’s Pizza, Pandora, Timberland, LinkedIn, Yelp, Zillow, and many other well-known names gained their first national exposure as honorees of the Inc. 5000. 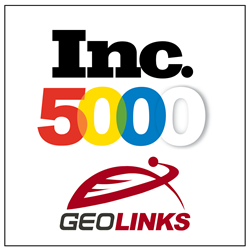 Since inception in 2011, GeoLinks has consistently achieved more than 300% growth in yearly annual revenue. While GeoLinks places 604 on the list overall, the company earned 5th place for Fastest Growing Telecommunications Companies, and 2nd place for Internet Service Providers. The 2017 Inc. 5000, unveiled online at Inc.com is the most competitive crop in the list’s history. The average company on the list achieved a mind-boggling three-year average growth of 481%—although, GeoLinks smashed the average with a three-year sales growth of 748%. The Inc. 5000’s aggregate revenue is $206 billion, and the companies on the list collectively generated 619,500 jobs over the past three years. Complete results of the Inc. 5000, including company profiles and an interactive database that can be sorted by industry, region, and other criteria, can be found at http://www.inc.com/inc5000. For media inquiries or to schedule an interview with GeoLinks’ CEO Skyler Ditchfield, please contact Lexie Olson at lolson(at)geolinks.com. Founded in 2011 by CEO, Skyler Ditchfield, and CTO, Ryan Hauf, GeoLinks is the fastest growing B2B fixed wireless ISP in California. Proud to service the largest coverage area of any single fixed wireless provider in the state, GeoLinks expanded its territory in 2017 delivering enterprise-grade internet, layer 2 transport, and turnkey construction expertly tailored for all business and Anchor Institutions nationwide. With industry leading installation times, GeoLinks’ flagship service, ClearFiber™, offers customers fixed wireless on the most resilient and scalable network ever built. Boasting ultra-low latency, 99.999% uptime, sub 10ms jitter, and a 4-hour max response time, GeoLinks prides itself on consistently delivering the industry’s best Service Level Agreement. Amongst its many accolades, GeoLinks was the largest construction grant winner for California K-12 schools and libraries in both 2016 and 2017. Servicing thousands of businesses across the country, GeoLinks officially became a CLEC and public utility in 2017.